John Calvin (1509-1564) was a French-Swiss theologian who is generally considered to be the greatest and most influential Christian teacher of the second millennium. Calvin's life's work, the 'Institutes of the Christian Religion' is one of the most important summaries of Christian practice of all time. His religious administration and organization of the city of Geneva in Switzerland is the model for many millions of Christians worldwide today, especially the system of Presbyterian Church structure that the national Churches of Scotland and the Netherlands as well as countless others are based on. Calvin followed Martin Luther's exposure of the Roman Catholic Church as fraudulent, corrupt and apostate, and made it his life's work to define Christianity as simply and clearly as possible so that such apostasies and departures from its true meaning would not be possible in the future. 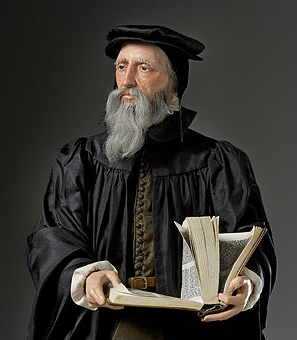 Calvin became the leader of the Church in Geneva in 1536, and set about making it the primary Christian theocracy in all of Europe. His system of Church organization became known as Presbyterianism. No longer were single individuals made 'kings' and 'sub-kings' of Churches under their control as in the episcopalian system of Bishops. Instead local Churches elect representatives to Councils of Elders called Consistories in Geneva, generally known as Presbyteries in English. These Councils oversee individual Church ministers and their Councils (Sessions), and are overseen themselves by higher Councils meeting less frequently called Synods and General Assemblies. Calvin's influence on the Church of Jesus Christ is immeasurable. His clear elucidation of Christ's teachings and their ramifications played a central role in bringing Europeans out from under the superstition, disease and darkness of the Middle Ages, in the liberation of Christians from Roman imperial oppression and in the exploration and colonization of North America and the creation of the United States. This page was last modified on 18 October 2013, at 12:32.